Benefits: Puts leaking tanks (metal or plastic) back in service quickly. Prevents Corrosion Prolongs the Life of new and existing tanks. Products Contained: Extremely corrosive and high temperature chemicals, acids and waste fluids. Call us for material compatibility of your corrosive chemicals. Liner Materials: Quality materials in various thickness determined by project application. 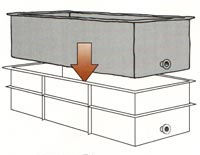 Construction of Liner: Dielectric seaming creates full material tear strength and smooth bonding. Custom manufactured to any shape, size or configuration. Can be put over Koreseal lined, lead lined or coated tanks. Can be used in steel, plastic, wood, concrete, fiberglass tanks, old and new. Can hold a wide range of chemicals from pH1-pH14; and will withstand temperatures up to 200º F because they are made from a variety of available materials. Quality quick fix that will extend the life of your existing tank. Perfect for the electroplater where an insulator is needed for steel tanks and helps prevent build up. Used in almost all industries where corrosion and/or contamination is a problem. We have years of experience installing premium liners to hold Chromic Acid. By adding a skirt to the top 12" - 24" (the fluid/air interface) a liner can provide full life-expectancy. Most liners are easily installed by your own personnel, we can also provide an installation supervisor or full/partial installation crew. Research is ongoing because our goal is to have every liner last at least five years. If you think you have a problem that can't be solved, contact us and we will find a solution.